If you are a computer guru, you may remember the term GIGO. This term stands for Garbage In. Garbage Out. So, what does this have to do with your dog’s diet? Well, your dog may be no walking, wagging, and barking computer, but he or she works in the same way. What food goes into your pet will eventually come out in the end. Your dog’s diet will affect the outputs considerably. Other factors play a role such as illness, nerves, and the weather. You can tell a lot about the health of your hound by the outputs produced. As any responsible pet owner knows, cleaning up after your pet is not the most pleasant job, but it is a necessary one. Being choosy and selective about your dog’s diet will make cleaning up after your pet much easier. When your dog is eating a diet high in fillers, your pet will show it. The excrement will be large in size and often runny and hard to pick up. You may notice when you give your pet leftovers from the table, he or she is really happy, but you aren’t exactly smiling on the next trip around the block. The outputs of a pet eating an unhealthy diet is just plain messy, stinky, and large. 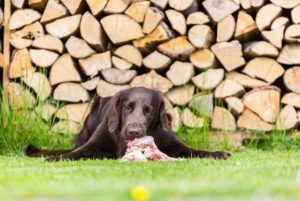 Even treats such as rawhide bones can change your dog’s stool. Your dog’s diet consists of everything your pet eats from treats to mealtime. Monitor how treats affect your dog’s outputs to determine how healthy the snack really is for your pet. If you choose to feed your dog a balanced diet that is high in quality, you will notice a particular difference in the outputs. Cleanup may not be placed on the top of your things to-do list, but it will be much easier and more tolerable. When the dog’s diet is healthy and nutritious, you will have less mess in the yard or kennel. Dog handlers with service animals are educated about the importance of a healthy diet and outputs during training. It is important, for example, that a guide dog not have an accident while working. The public would not be highly tolerant of trouble in a restaurant or grocery store. Take a tip from trainers and keep your dog’s diet healthy to avoid these messy situations. Consult your veterinarian to decide what type of diet is best for your dog. Look for a dry dog food that lists meat as the first ingredient. This will help to reduce the amount of fillers your pet will consume. Feeding your pet on a schedule is important. When looking at your dog’s diet, do not simply focus on what you are feeding your pet, but also focus on when you feed your dog. If your dog’s diet includes consistent mealtimes, you will be better able to predict your dog’s potty schedule. This can play a major role in effective housebreaking technique. Helping your pet eat right is the first step to maintaining a healthy diet for your dog. Your dog’s diet, when perfected, will keep things running smoothly. Minimize outputs and mess with nutritious, scheduled feeding. Beware of treats in your dog’s diet. Knowing what goes into your pet will reduce the garbage coming out.